To learn more about our products and installation please contact our main office located in Comanche, TX. 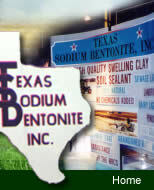 We have experienced sales staff capable of assisting you with our products and the various markets that utilize sodium bentonite. We have several retail outlets throughout Texas. Please contact us for the one nearest you. Customers can also pick up directly from our bagging facility / wholesale location. *From the intersection of Hwy 377 / Hwy 16 - Turn north on Hwy 16 (toward Deleon). Drive approximately .75 miles. Turn left on Industrial Blvd. (the law enforcement center and municipal airport are located off of Industrial - Look for signage). Stay on Industrial for approximately 3 blocks. Turn right on Dudley St. Stay on Dudley until you arrive at warehouse (approximately 1 block).